Unprocessed organics (Construction Demolition / Green Waste) are received at the gate. 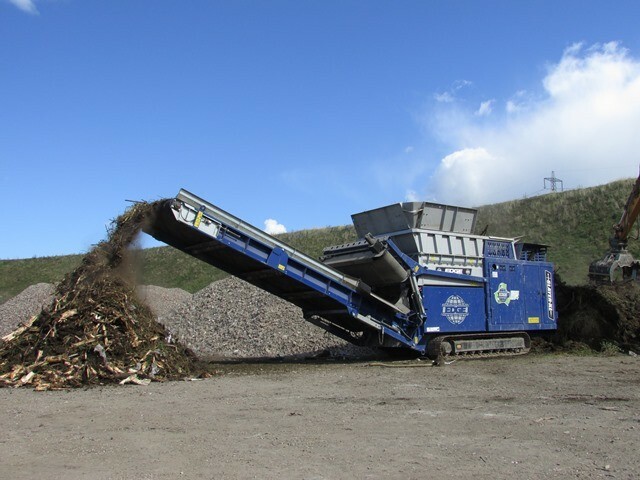 All types of green waste & wood accepted can be directly processed. Time is set aside to process treated (dirty) wood on the same wood processing line, but at another time. 1. Primary Shredder – Driver of Wheel Loader A stationed in a targeted feed area of the plant constantly feeding the Primary Slow Speed High Torque Shredder. This stage prepares the material for the wood processing plant which follows. All material will be taken to a piece size roughly at 12-16 inches & all ferrous metals are removed by the magnet. Loader driver rejects individual large contaminants before they ever enter the line, acting as a first major “pick”. The removal of ground pickers gives a huge gain in efficiency and site safety, leaving no potential for accidents on the ground. 2. Primary Screen (Trommel) – At this stage all pre-shredded material from the Shredder is directly fed in to the Trommel hopper. Direct feeding removes double handling of material, reducing loader fuel usage and wear & tear. It also frees up a worker from performing an unnecessary task, saving on wages. Fines from the trommel are fed toward to final product area and the oversize material continues down the process line. 3. Picking Station – Oversize material from the Primary Screen (Trommel) directly feeds the picking conveyor. No double handling ensures cost savings. Waste is removed from the shredded product here, cleaning the material with a 100% positive pick. A higher value finished product with little waste is created here. Optional, but recommended options for the picking Station at this stage are a magnet, blower & lights cage. The magnet will give final removal of any metals before being grinded. This minimizes costly repairs & wear. The blower will act as a separation of fine waste products like plastic missed by the pickers. The lights cage will collect this waste without risk of contaminating any future product. 4. Stockpiler – The conveyor creates large windrows of pre cleaned material, cutting out expensive double handling and extra movement of material. This material is now ready for grinding. 5. Secondary Shredder (Grinder) – Maximal throughputs (loaded by Wheel Loader B) of grinder are ensured with clean, well sized and pre shredded product. There are many benefits to pre shredding and pre screening. The amount of material needing grinded is greatly reduced from what was entered at the beginning of the process. Metal & waste has been removed, as well as a lot of heavy fines which was removed at the trommel screen stage. This means that the environment is optimal for the grinder to work hard with the least possible risk to excessive wear and tear. This minimizes breakdowns and downtime. Reduced usage of the grinder provides large savings on fuel also, and saves money on wear parts like grinder teeth. The grinder is now only used when it can be fed to work at 100% load. 6. Stockpiler – This stockpiler conveyor serves to free up the grinder loader driver to constantly feed the grinder. The grinder will only be running a certain amount of time and so a tracked stacker is a good choice here. The added mobility allows the stacker to help other parts of wood processing on site. 7. Edge Mulch Master – A one of its kind in the industry, this product reduces expensive and slow wheel loader turning of organic materials. Material is aerated which reduces the fire risk on site. Wheel Loader B, when not loading the grinder, can quickly and efficiently load the mulch master. As a result, turning material takes less time and the final product is higher quality. Spraybars built in as standard to the Mulch Master enable either watering of product (decreasing fire risk) or colouring of product (increasing sellable value). 8. Finishing Screen – A clean area is reserved for final product production and at this stage, the material can be ran through various finishing screens (Trommel & FreeFlow 186) to ensure numerous perfectly sized products with high value & free of waste. Consistently sized material has small amounts of the fines created on the primary screen (<half inch) mixed to create a finished product. This is done at a ratio which avoids fines and still receives top money due to being top quality product. A. Recirculating Shred – A high torque shredder with fine baskets processes the ferrous metal output material from the Primary Shredder. The magnet will throw large amounts of shredded wood out with the magnet which has metal tangled in it. The Edge Slayer XL will process this, making the metals sellable and so the wood reusable at the beginning of the line again. This process is separate from the primary line and is performed by Wheel Loader B when the grinder/mulch master is not in operation.